We do care what you care ! We carry what you care ! We do connecting and intergrated all industries with our service platform. Moreover to provide the best service with the logistics trend in the world. Reduce the logistics handling cost directly. Sharing the data and information with all our clients. Provide the best service by connecting information flow and intergrates agents good service all over the worlds. Creating the maximum benefit for the clients. - integration of cargo flow, information flow and finance flow. - Specialized in sea-air combined transportation. Sea and air Freight consolidations. - Logistics and warehousing service. D & M Logistics has good relationship & competitive rate with world well-known carriers, to provide variety freight & services. D & M Logistics can provide the door-to-door services that included customs clearance, inland transportation, seafreight…etc. D & M Logistics can get cross trade business freight at any point. 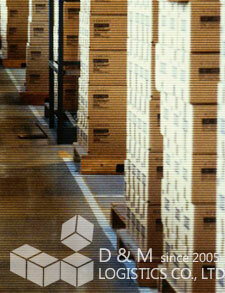 D & M Logistics can get competitive rate basic on good quantity service to increase client's competition. One single contact window for the one stop shopping service. Monitor the shipments all the way during the transportation periods. Global net work service for monitor cargo with trace and track. Meet with clients and understand their demand with build up the SOP for the cargo flow. Provide the professional " One stop " shopping service. With the track and trace cargo controlled. General Air/Sea freight Import/Export customs. Bonded cargo declaration, transit cargo declaration. No matter charter trucking service or consol truck service, D & M Logistics all can provide customizes service to meet your demand. Provide the best contract rates for reduce your shipping cost. Rapid quotes for competitive rate to improve Clients maxmium competitive power . Provide our best service to improve clients' demand. March forward and grow up with clients together.